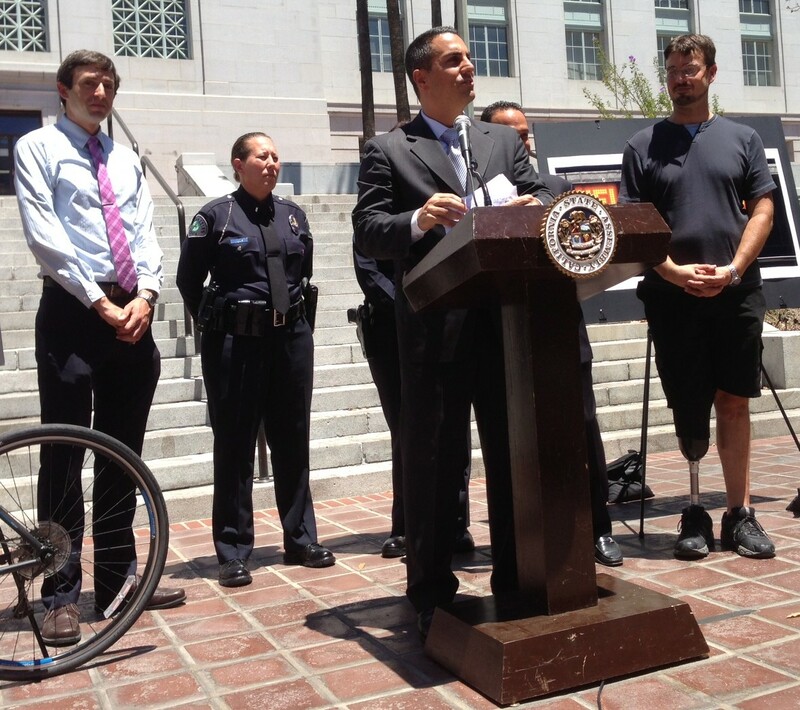 Mike Gatto speaking on the importance of reducing hit-and-run crimes at a 2014 press conference at Los Angeles City Hall. Behind Gatto are, left to right, LACBC’s Eric Bruins, two LAPD representatives, L.A. Councilmember Mitch Englander, and Finish the Ride’s Damian Kevitt. Photo: Joe Linton/Streetsblog L.A.
Last week, I conducted a phone interview with Assemblyman Mike Gatto, best known to Streetsblog readers for his tireless work fighting for tougher laws to prevent hit and run drivers. While Gatto’s efforts have proven popular with safety advocates, his center piece legislation to create a statewide hit and run alert system was vetoed last session by Governor Jerry Brown after sailing through the Assembly and Senate. Last year, this hit and run legislation came together at the eleventh hour. This year, AB8 was one of the first pieces of legislation introduced, giving Gatto and safety advocates more time to press their case. As you’ll see, Gatto is confident that Brown will see the light and California will join Colorado as the only states with an alert system to broadcast crash details similar to what happens when a child is abducted. Before our interview ended, I promised Gatto that I would prominently display contact information for his offices (here) and help people contact their legislator (here) and Governor (here) so they can let their leaders know how they feel about this legislation. As always, the interview after the jump is lightly edited for clarity and brevity. If you want to listen to a “clean” version, or prefer listening to reading, the audio is below. Asm. Mike Gatto: For our listeners, this is Assemblyman Mike Gatto. I represent a district that stretches from Hollywood to La Cañada, it includes Los Feliz, Glendale and Burbank. I’ve introduced several measures over the years that has to do with Hit and Runs because I think it’s a real problem. Almost every policy maker tries to say that they are in favor of getting people out of their cars, and then take alternative means of transportation. In my opinion,the greatest means of alternative transportation is using your body to propel yourself down the street. Whether that is on a bike or walking. That is so joyful when I get a chance to go somewhere using those methods, but we don’t do enough to protect so-called vulnerable road users. One of the biggest vulnerabilities when you’re a vulnerable road users is when someone hits you and leaves you to die on the side of the road. This is a major issue for me, and its a major issue in the Los Angeles region. That’s why I introduced these bills. The centerpiece of my legislative package on hit and runs is a bill that would allow local law enforcement to use California’s existing highway alert infrastructure to engage the public to help police find those who commute hit and runs. If you think about it, hit and runs are a crime where, right after the event, (there is) the means and mechanism to get away very quickly. This isn’t a stickup in the park, this isn’t a cyber crime that can be traced easily. This is somebody who has decided to keep going at a high rate of speed away from a crime scene. They often have the means of traveling down an artery that allows them to get on a freeway and disappear. We think the only way to reduce these accidents is to have a few high profile prosecutions and let people know they will be caught. What better way to let people know they can be caught other than seeing people’s names, and license plates, or partial plates, and vehicle descriptions broadcast on the message signs over freeways? I can also say that this isn’t coming from an informational vacuum. The City of Denver had a problem very similar, they had a low apprehension rate before they created their program. (For a discussion of Denver’s success with a similar program, click here – DN). If you commit a conventional murder, if you kill someone with a gun or a knife, there is about a 65% chance that you will be convicted and go to jail. However, if you kill someone with a vehicle, if you just run someone down, there is about a 20% chance that you will be convicted and brought to justice. When Denver, began their plan, which is similar to my proposal, they saw their apprehension rate go from 26% to 76% in one year. Can you imagine if that were to happen in Los Angeles? How much good it would do to stopping this very serious problem. Damien: A lot of people who are advocates for safer walking and bicycling, there was a distraction in the past couple of months as people were debating the mandatory helmet law thaw is now off the table. But as I talk about this bill, I have yet to find someone who isn’t excited about it. But because Governor Brown vetoed this legislation last year, the question is: why get behind this legislation again if Brown is just going to veto it again. A number of times, what seems logical and reasonable is what is not done. I wish that was not the case, but it is. But that being said, a number of major quests, whether the public supports them or not, are successful because a law maker continues to plug away after repeated setbacks. The example I can give is providing driver’s licenses for the undocumented. Gil Cedillo ran that bill for fourteen consecutive years. Fourteen years. And it was vetoed, and it was held in various legislative committees, and it was voted down, but he kept at it. Whether you agree or disagree, he kept at it. He finally got it passed into law, I think he was already out of the legislature, but he got to see it become law. The last thing I will say is about Jerry Brown. I know he disappointed a lot of people last year, but I think he’s a lot like Winston Churchill. Churchill is pointing out that you would have to be insane to be presented with a lot of facts and not change your opinion. And here, the facts are clearly on our side. Damien: The City of Los Angeles and some of the City Council members are embracing hit and run reform. We just got word this week about a permanent reward system. The city is trying to do a small version of an alert system. Do you think these efforts aren’t just good policy but may also have the impact of pressuring the Sacramento to act on your work? Asm. Mike Gatto: I don’t know if that will actually motivate people like the Governor. I know this comes from good places. I know this isn’t copycat legislation. I know it’s not derivative. It comes from real willingness to address a problem where it’s a real problem. But it’s also frustrating because city governments shouldn’t have to foist the burden…what has our society come to where we have to offer massive rewards to get people to do the right thing. Should we really have this huge financial burden…There are 20,000 hit and runs in Los Angeles every year. Can you imagine if even a small percentage of rewards are collected every year? It would do a lot of good, but gosh would it become a burden. Look at the alert system (social media system being created by LAPD). A guy like me that represents a city that includes incorporated Los Angeles County, the cities of Glendale, Burbank and La Cañada plus the city of Los Angeles. The 5 Freeway runs right through my district. If someone hits someone in Burbank and flees into Los Angeles, the site of the accident is outside the city. We need a statewide system that goes on our interstate highways that allows the CHP to get people who can flea lots of different cities, and lots of different regions, very fast. Damien: That covers my questions, is there anything you want to add, or should we wrap it up? Asm. Mike Gatto: I would encourage people to contact my office, you can find me very easy on the web. I see all the email, I answer them all. If people want to help us by volunteering or just contacting their legislator or contacting the governor, then by all means please do it. We’re trying to make a difference and I’m going to stick at it until we do.